John returns to us with another highly technical look at scanning. 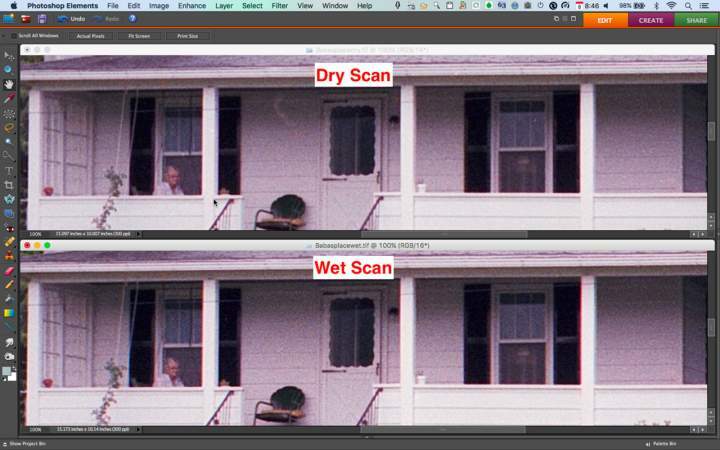 Wet scanning takes scanning quality to the next level and John runs through the process with us. It may be labour intensive, but the results speak for themselves. Getting back into film photography a few years ago allowed me to truly understand the enhanced dynamic range and resolution available with film especially when you start shooting medium format. With the cost of film equipment so cheap these days many very high quality medium format cameras are now within reach of most anyone. 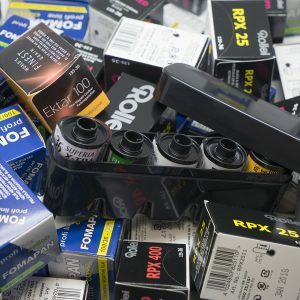 Although shooting film has the added advantage of slowing you down such that you take fewer but better images, there is still the cost film and more significantly the developing. I have tried a number of development labs and the item that always hits me most is that the price of scanning can be 1.5 to 3 times that of development. This is understandable as the development of the film with modern processors is less labor intensive than the actual scanning. For the labs that I have used this digital image capture has been done with dedicated dry film scanners. I tried to scan some of my negatives with my Epson V500, and although this scanner does come with the appropriate holders and software, I was never able to come close to the resolution received from negatives scanned by the processing labs. I toyed with the idea of trying to attempt some wet scans of my negatives especially after exploring the very informative web site on this technique from ScanScience (http://wetmounting.com/) but was delayed due to the fact that my Epson V500 did not have the High Pass Optics required to make wet scanning worthwhile. Then earlier this year though I built a panoramic 6×14 camera (http://www.japancamerahunter.com/2016/09/camera-geekery-%EF%BF%BC3d-printed-panoramic-6×14-camera/). The negatives from this camera are too long for the film scanners available at the labs I have used. The ones that would scan them at all scanned them in halves or more that required me to patch them together in Photoshop kinda defeating the purpose of having a panoramic camera in the first place. Thus now I had a genuine excuse to invest in a higher quality scanner. After discussing this situation with Dan at ScanScience he directed me towards an Epson V750 or the newer version of this product the Epson V850. Though the Epson V750 is the older version it gives almost identical results to the V850 according to reports and of course costs a little less. I opted for the V750 if I could find an new one. I was able to do so and purchased it. 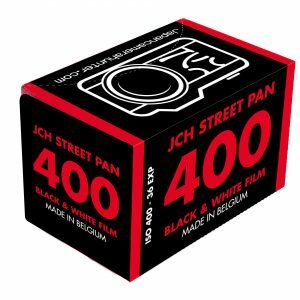 I also purchased a wet mounting kit from ScanScience for both 35mm and 120 film. sensor, in this case a CCD, in the base of the unit. 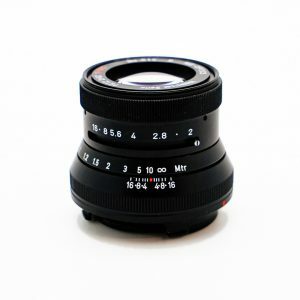 The lens focusing this image is fixed so that whether the image is at the optimum focus point depends on the height of the film plane from the surface of the scanner glass. The depth of field of the scanner lens is very narrow so that tiny changes in this elevation, in the order of 0.2mm, can affect the image resolution. Though the scanner and the supplied film holders are supposed to put the film at this optimum distance, production tolerances are not that exact such that every scanner that comes off the production line has a slightly different optimum focus point. This is why both the V750 and V850 come with holders that allow you to adjust, or tune, this scanner-to-film height to get the optimum focus for your individual unit. The holders that come with the V850 have a far more exact adjustment capability than those that come with the V750, but the idea is the same. Unfortunately, my V750 only came with two scanner glass to film positions and these measured for my configuration at 2.9mm and 3.5mm. There is one more height possible that is without any of the adjusters installed and that measured to be 2.5mm. These were all measured with the depth gauge on a plastic dial Vernier caliper. I really wanted to determine the optimum scanner glass to film position more accurately than this so instead of using the film holder supplied with the scanner I printed some myself on my 3D printer. Doing so I could test scanner glass to film positions of 1.75mm, 2.03mm, 2.05mm, 2.31mm, 2.39mm, 2.64mm, 2.90mm, 2.97mm, and 3.09mm. The primary driver for this was the fact that the scanner is supposed to have an optimum scanner glass to film position of 2.6mm which was already outside of the range the adjusters on my supplied holder could obtain. 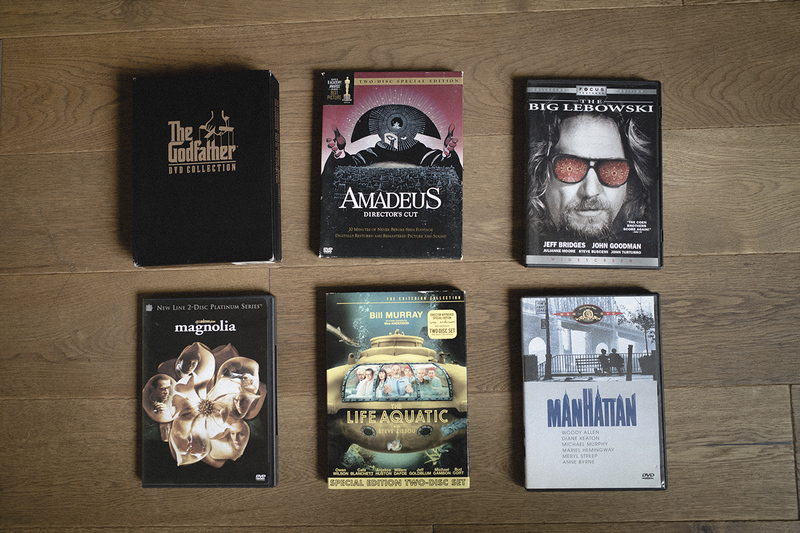 One of these typical film holders I printed is seen below. Scans were done at 3200 ppi of a 35 mm black and white negative of a PIMA ISO Resolution Chart that I bought as part of my wet scanning kit from ScanScience. Scans were done for all these scanner-to-film heights. The scans were saved as lossless TIFFs with no in- software sharpening. Below you can see the PIMA ISO Resolution Chart with the area of interest for further analysis highlighted. Now this website looks at using the modulation transfer function of an image to determine the absolute resolving power in line pairs per mm but I did not need to go that far, all I wanted was a way to quantitatively compare scans of the target negative at the different elevations. I just needed to compare these to one another relatively. As outlined on this site, I used ImageJ software, a public domain software off the NIH site. 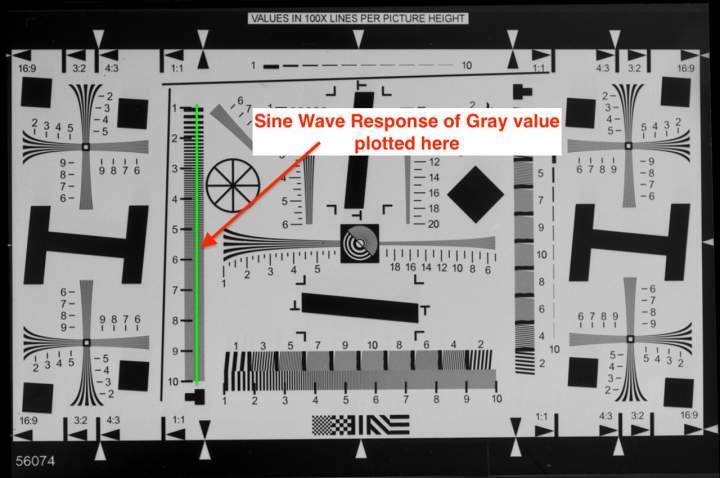 Concentrating on the area of interest on the scanned PIMA ISO Resolution Chart, the ImageJ software allows you to generate a sine wave graph or modulation transfer function of the gray values for the series of lines. The image below shows a screenshot of the ImageJ software and the graph of gray values depicted as you move from left to right along this series of smaller and more closely spaced lines. 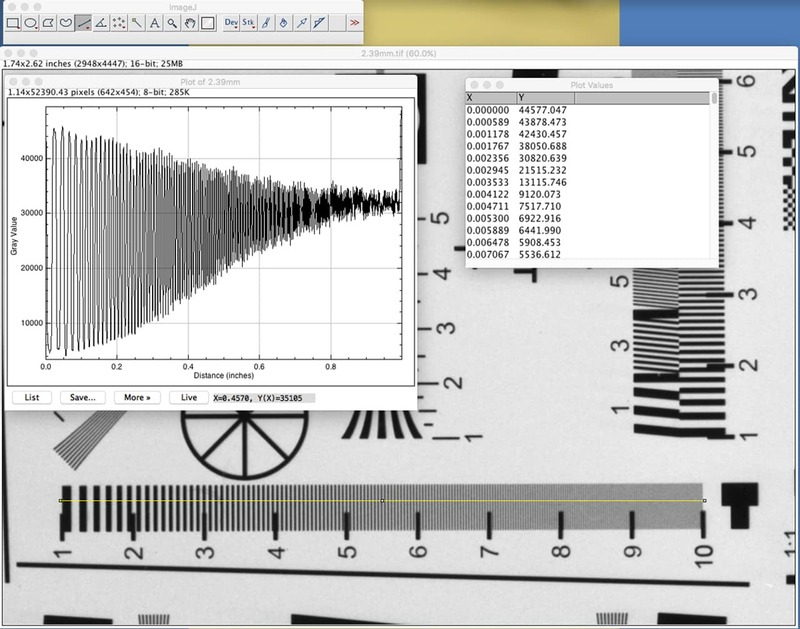 The raw sine wave data can be downloaded from the ImageJ software to an Excel file for further analysis. A typical result of the Excel graph is shown is shown below for the 1.75mm scanner glass to film position. 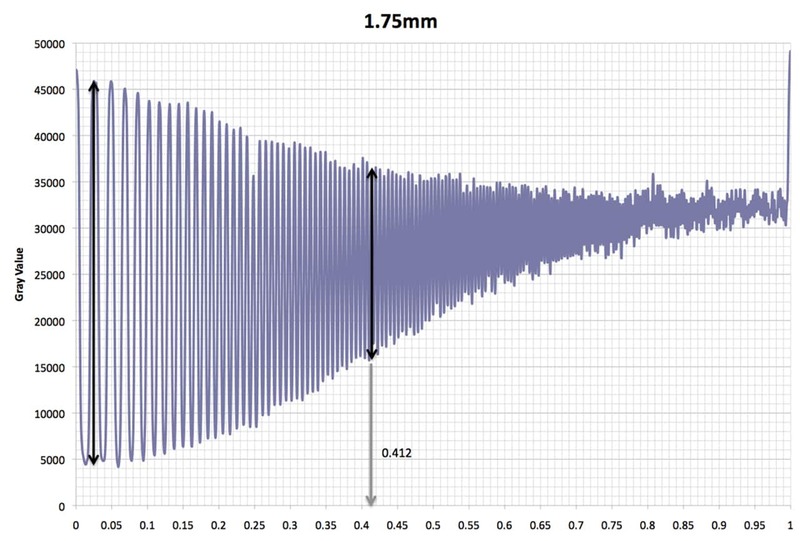 Using this graph you can to determine the maximum amplitude of the sine wave on the left hand side, divide it by 2 to get a representative estimate of the 50% MTF. Then move this 50% MTF estimate to the right until it matches the diminishing amplitude moving in this direction. The number of the x-axis at this matching gives an idea of the relative resolving power of the image. Setting the scale at 0 to 1 gives you a relative value for 50% MTF or a relative number for the resolving power of the scan. 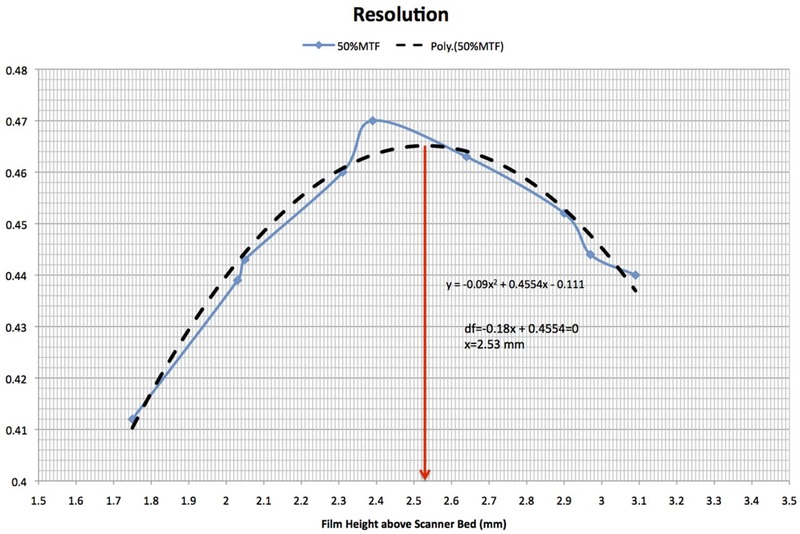 This can be repeated for all scanner glass to film position heights determining the relative estimate for the 50% MTF for each one. The relative 50% MTF values can then be plotted against the scanner glass to film positions they are related to. This should result in a “bell-type curve” with the center being the optimum scanner glass to film position height. 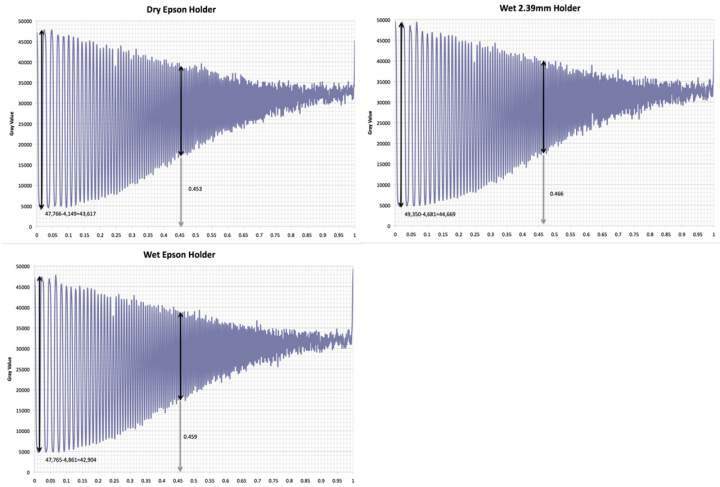 Fitting these data points to a quadratic curve and taking the derivative of that curve and setting it to zero gives the optimum scanner glass to film position height for this scanner based on these tests. In this case this turns out to be about 2.5mm. 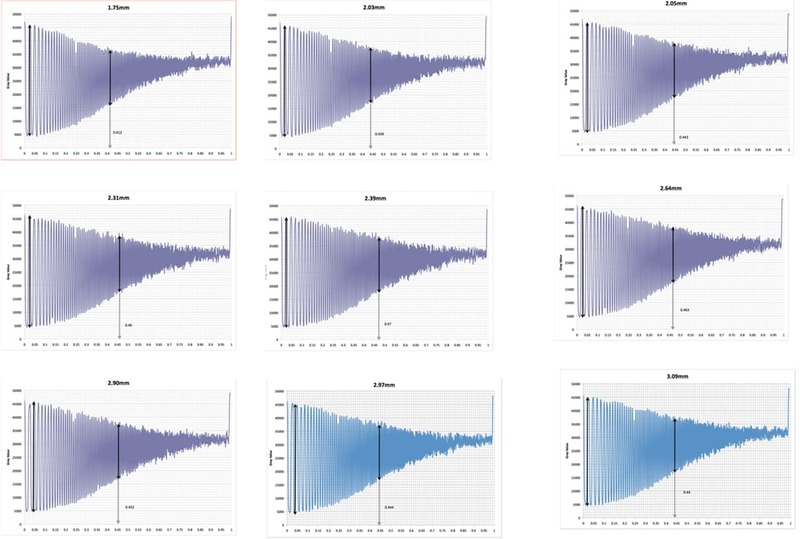 One could also do this by visually comparing all these graphs to determine which had a “fuller” or “fatter” curve and thus could probably estimate an optimum that is of similar accuracy. Actually the resolution of my 3D printer is probably higher than that of this optimum height estimation. Using an numerical estimate of the 50% MTF is just easier for me personally. It is certainly more accurate than my eyes simply looking at the raw scans. 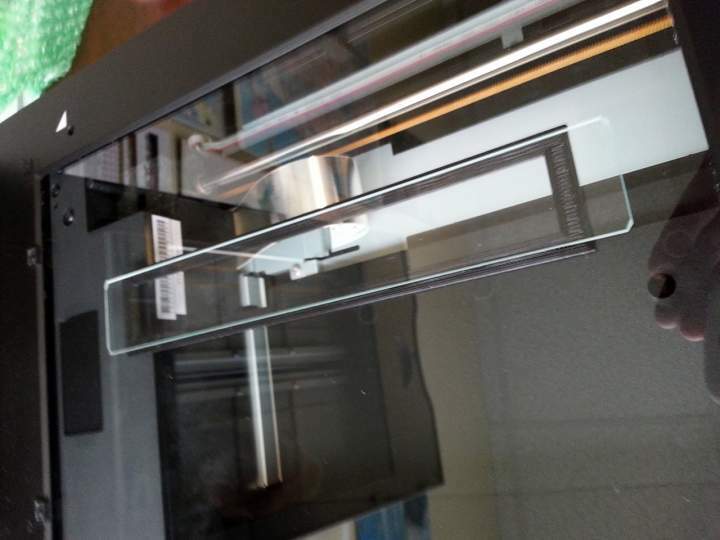 The above optimum scanner glass to film position height determination was all done with a wet mounted negative for the simple fact that the dry mount holder supplied with the scanner could not accommodate these differ heights and the supplied holder was needed to keep the dry mount perfectly flat. Now it was time to compare the resolving power of wet and dry mounting both in the supplied holder with no height adjustments (as that is the closest I can get to the optimum height with the supplied holder) and with the 3D printed support I had that was closest to the optimum height. The results of this head-to-head comparison can be seen below. Though the wet and dry scans using the supplied holder look similar the one using the 3D printed shim is significantly “fuller” or “fatter” denoting a higher resolving power. Enough with the math, in reality using the V750 with the supplied holder, wet or dry mounted, gives results that I have found to be the same or in many cases much better than the scans from the development lab. 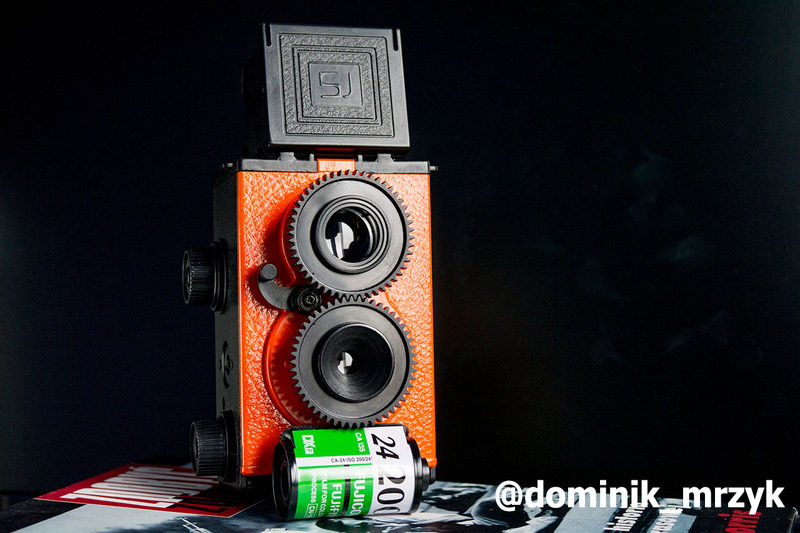 One additional advantage of wet mounting though is the ability to keep the negative perfectly flat. We have seen that due to the very small depth of field in this fixed focus scanner keeping all parts of the negative at the same distance from the scanner glass is important. For the target negative that was used here that was not a problem with the supplied holder as the film was new. Older negatives, especially ones that have not been stored in the upmost conditions may have significant curl to them. Wet mounting is the best way to get rid of this curl for optimum scanning. 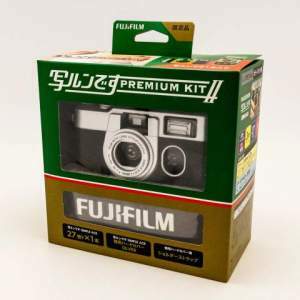 can also allow the reduction of visible grain in Black and White film. Below shows an image from a recent hike I made outside of Darrington, WA. 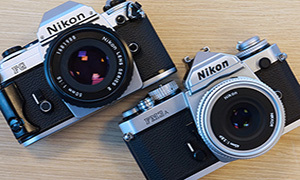 Three images, taken with a Nikon FM3a, 50mm f1.2, and Ilford hp5 plus film are shown. One is the scan I got from the lab, one a dry scan with the Epson V750, and one a wet scan using the ScanScience kit and the Epson V750. There is a definite reduction in visible grain in the scans from the Epson V750. Some might say that the Epson V750 scans are “softer” but that seems to be that the eyes at first glance are “fooled” by the grain (and the diffraction that it produced dry lab scan) into thinking that the dry lab scan is sharper and thus holds more details. Closer observation shows that this is not true. If you look at the faded upper sign on the post you will see that many of the faded letters on this white sign are distinguishable in the V750 scans. In the dry scan only the “N” is partially distinguishable as the grain in the lab image obscures all the rest. 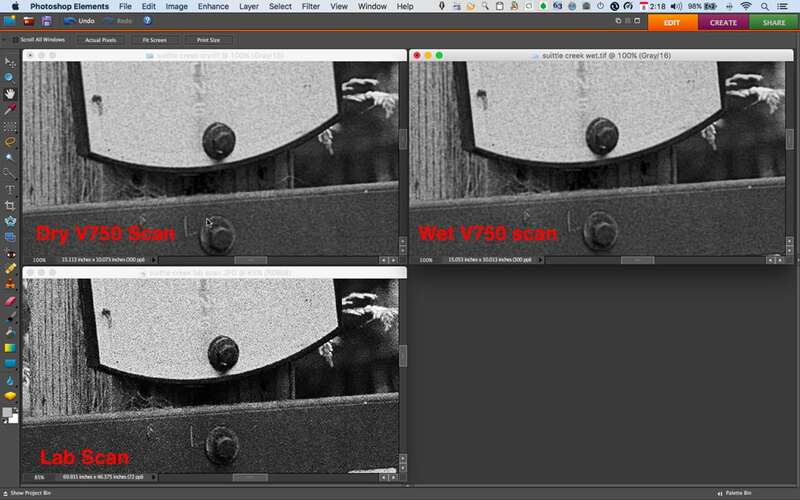 Thus the V750 scans remove the film grain, allowing more “information” to be extracted from the image. When comparing the dry and wet scans done on the V750 little difference can be seen though there may be a little more dynamic range shown on the wet scan. Now let us look at some color images. Below is an image taken by me in 1983 at my Grandmother’s house in rural central Pennsylvania. This was taken with the first SLR I ever owned a Pentax ME Super with the kit 50mm f1.7 lens and Kodak Safety Film 5035 (KodaColor II 100). Taken on a trip down there from Detroit before I left for the West Coast, knowing I would probably never see her again. As you can see the wet scan at 2400 ppi, viewed at 100% is so good that you can even see that my Grandmother is smiling on the porch as well as some of the links in the chains of the swing she is sitting on! Below is a comparison of a wet and dry scan of this image viewed at 100%. Both are very acceptable captures of all the detail that this old negative can capture. If one looks closely though at say the window to the right with lamp in it or my Grandmother’s face it seems to me at least that the wet scan can extract more of the dynamic range present in the film than the dry scan. That said, both are good scans and if printed one could question whether the printing process, depending which is used, could capture as much of the dynamic range as the wet scanned negative. It also should be noted that this part of the image was from the center of the negative and this old film has a lot of curl to it. Whether the dry scan mounted in the holder would have been flat enough to produce consistant results on the edges is questionable. about a 90 degree angle of view. I wet scanned this at 2400 ppi so of course the actual .jpg is about 50MB and Jpeg2000 file over 250MB. Obviously that is not what is shown here but I did combine this image with a section of the original file viewed at 100%. Note the amount of detail that the wet scanning can extract from this film is so good that you can make out my Uncle fishing on the shoreline! So obviously the Epson V750 can give some great results and the ScanScience wet mounting kit can enhance these results even further and ensure that the negatives remain perfectly flat in the process. The ScanScience site (http://wetmounting.com/) does a much better job than I can on the descriptions on how to use their kits not just for the V750 and V850 but also a number of other flat bed and film scanners on the market. I am still working on my technique to minimize dust that has to be digitally removed later, but that will simply take practice. Since the labs that I use charge so much for scans and these scans are worse or at best equal to what I can get from the Epson V750, I think my days of having scans with my developing are over. A note about scanning software. That supplied with the V850 cannot access the High Pass Optics of the scanner. That supplied with the V750 I purchased does but the software would not work with my latest version of Mac OS. As a result, if you purchase either the V750 or V850 you will have to upgrade the software supplied to access these High Pass Optics. I opted for SilverFast Ai Studio Version 8.8 which works well. Many thanks to John for coming back to us with another fantastic article. If you have your own experiences or tips please leave them in the comments below. Nice! I considered buying an Epson V750-ish for a long time but decided against it. It’s only benefit is its ability to scan medium format negatives. Since I mostly shoot 35mm, I opted for the Reflecta RPS 10M which performs much better than the Epson. Also, it can scan an uncut roll of 35mm in batch mode. If your exposures on a single roll are very uniform, you can have the scanner scan the whole roll in batch mode. I use Vuescan instead of the outrageously overpriced Silverfast. 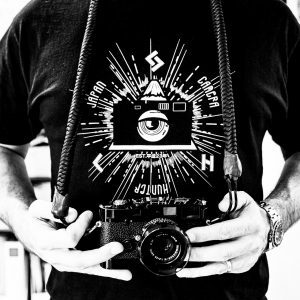 This also allows me to scan raw images. Thanks very much for this article, it’s really useful, I’ll definitely be applying what I’ve learned from it. I have a V750, and the special wet-scanning holder. 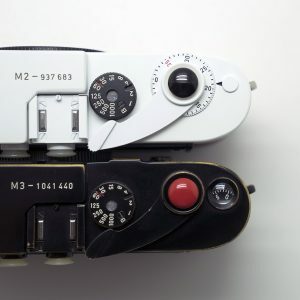 I also have a Imacon Precision 2, and a 949 ( was lucky finding them ). Honestly, gosh, if you haven’t got a scanner, and want to scan film. It’s 2000 bucks, with holders and scsi card ( just find an old computer) . It’s quicker, it’s better scanned and realy less messy. !! You mention that the scanner removes film grain, which seems odd to me. But I have noticed similarly in my own scans that there is less noise/grain compared to lab scans, I wondered if the lab uses more sharpening and the grain in their scans is not film grain but sharpening-noise? In some lab scans it very well could be that the lab is using more, probably too much, sharpening. But also there is diffraction off the grain in a dry scan (depending on the film type of course) this diffraction is minimized in wet scanning because of the liquid that the light must pass though. I see zero difference between the dry and the wet scan of the b&w negative. In the colour shot, perhaps the wet scan slightly opened up the shadows a little bit more. But hardly. Very good article. Actually I think that ‘High Pass Optics’ is Epson marketing speak for improved coating on the scanner lens and mirror over the standard V700/800, at least that’s what I was told by an Epson rep at a show though both scanners are quoted as giving the same DMax. The upgrade to the Silverfast software from SE to the full AI version allows for multi-pass scanning for improved dynamic range through over-sampling (if you’ve got time!) and I think that’s probably standard with the excellent Vuescan. It would be good to know a bit more about the scans you get from the lab – Frontier? Resolution? Oil mounting was standard on the Crosfield or Hell drum scanners I used to operate when I was in the print trade back in the 80s and 90s. I tried to replicate the technique with my Epson flatbeds but it was tricky to mount the film on a flat bed compared to a perspex cylinder, and I didn’t find the difference significant. About 10 years ago I did my first experiments with using a digital camera as a scanner and found the results so good I abandoned flatbeds altogether. I get such good results, I wouldn’t even go back to oil-mounting on a drum scanner now. Any scanner or clunky scanner software is just too time consuming.